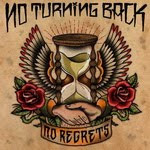 And yet another song from the upcoming No Turning Back album! "STEP BY STEP you're gonna make it, DAY BY DAY you're gonna take it, Keep your head up high". This stuff is tight beyond description! Click here to listen or after the jump!